Cat of the Week: Kittens, Kittens, Kittens! This week Huntsville Animal Services is featuring "kittens, kittens, kittens" as their "Cat" of the Week. 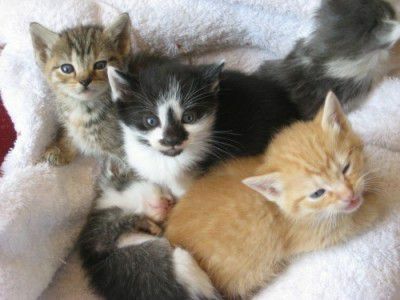 They are "over-run " with kittens...so now is your chance to take your pick! Huntsville Animal Services has all sizes, shapes and colors, both male and female, long-haired and short. It's kitten season and they have the perfect kitten for you and your family. There is one litter of six adorable babies. They are not yet ready to leave Mom, but Karen is taking names for adoptions. They are being socialized to other cats, dogs, and an active household. They have multiple colors including: Orange Male, Black/White Male, Tabby/Calico Female, Tortishell Female, Gray/White Male, Brown Tabby Female and of course, Mom who is a gorgeous Torbie/White. Call Karen for more information. 256.652.9229....NOT AT THE SHELTER.....SHELTER personnel will not have details as Karen is fostering them at her personal home. Adoption fees including sterilization, Rabies, collar, identification tag, deworming, 1st vaccination, Feline Leukemia and Feline AIDS and city license (if needed) is $93. The kittens can not be adopted for several more weeks, they have to be 2 pounds and are only 1 pound...so, about another 3 or 4 weeks! More Huntsville Animal Services Info on Next Page! We are the largest (& nicest) shelter in north Alabama. We average an intake of 175 animals per week. We are very committed to the pets on our adoption row, holding them until they can find a new home. The only time we don't keep the pet until they get a new home is if they develop temperament issues or become very sick. We have a very large selection of cats (and dogs). We always encourage people to stop in and see what we have! Main Office 883-3782 - need basic information about adoption or a lost or found pet. Dispatch 883-3788 -need to file a complaint about an animal? Call this number. Humane Educator 883-3794 - Jeremy Eslick, to schedule field trips, presentations, group outings (scouts, church groups, civic groups, etc. ), and volunteer opportunities. When Is Independence Day in the USA?